In a world where idealism is a scarce commodity, Aaron Swartz stood out. A computer programmer and political and social activist, Aaron had a quaint goal — to make the world a better place, to help us live our lives so that they make a difference. Ultimately, however, though he tried to save the world, he could not save himself. On January 11, 2013, Swartz, age 26, hanged himself in his New York apartment, after having been vigorously pursued by the U.S. Department of Justice for two years for hacking MIT's computer network and downloading 4.8 million documents from the JSTOR database, a private corporation that charged exorbitant fees for non-subscribers to view online research. 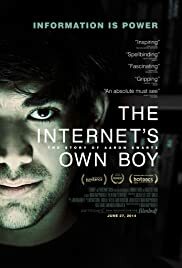 Swartz's story is told in a deeply moving and very disturbing documentary The Internet's Own Boy: The Story of Aaron Swartz, directed by Brian Knappenberger. The film traces Swartz' life from the time he was a three-year-old prodigy able to read a meeting notice posted on the refrigerator to his later years when he created the prototype for Wikipedia, helped start up RSS and Reddit and wrote specifications for Creative Commons, an organization devoted to enabling the free distribution of an otherwise copyrighted work. Wherever he was, however, he challenged the system and the corporate organizational structure whether it was in high school, Stanford University, or Silicon Valley. Though the film does not break new ground stylistically, the interviews with Aaron's family, girlfriends, and friends such as Net activists Tim Berners-Lee who created the World Wide Web and author Cory Doctorow are illuminating and often inspiring. Some of the best scenes are Swartz's political campaign to defeat SOPA, the Stop Online Piracy Act introduced in Congress and expected to pass. He galvanized the opposition with creative use of the Internet to ultimately defeat a bill he thought would restrict Internet freedom. He also worked for now Senator Elizabeth Warren, one of the few progressive voices in our politics. Swartz defended his action in hacking MIT's computers in a manifesto that read in part, "Information is power. But like all power, there are those who want to keep it for themselves. The world's entire scientific and cultural heritage, published over centuries in books and journals, is increasingly being digitized and locked up by a handful of private corporations. Want to read the papers featuring the most famous results of the sciences? You'll need to send enormous amounts to publishers like Reed Elsevier." In the tradition of Thoreau, he said, "There is no justice in following unjust laws. It's time to come into the light and, in the grand tradition of civil disobedience, declare our opposition to this private theft of public culture." While Aaron's decision to free scholarly works from MIT from private corporate control may have been ill-advised, the government's treatment of him as a dangerous criminal was unwarranted and out of proportion to the crime. Originally indicted on four counts, after his SOPA campaign was successful, Carmen Ortiz, U.S. Attorney for the district of Massachusetts, upped the number of counts to thirteen to "send a message." She accused Swartz of violating Title 18 of the U.S. Code, which carries a maximum penalty of 50 years in jail and one million dollars in fines. Ortiz who pursued the case even after JSTOR agreed to drop the charges, justified the indictment by saying, "stealing is stealing whether you use a computer command or a crowbar, and whether you take documents, data, or dollars." Attorney General Eric Holder defended Ortiz's prosecution before the Senate Judiciary Committee, terming it, "a good use of prosecutorial discretion." After Swartz' death, Ortiz issued a statement saying that her office had never intended to seek maximum penalties against him, a small consolation to Swartz' family. I think the same thing applies to society." As a fitting epitaph to Aaron's life, author Justin Peters, recalled an event held one week after his death. A large banner was spread out on a table where people recorded memories of Aaron and messages of condolence. According to Peters, "near the end of the night, a slender boy in a plain sweatshirt who looked too young to be there came over to the table. He uncapped a marker. He wrote simply, 'We will continue.'"